As I said in my last post, I've been reading Cornwell's Saxon Tales series. Naturally, these novels inspired me to get some Viking and Saxon miniatures. I don't have anyhting painted yet, but here are some photos to compare scales. 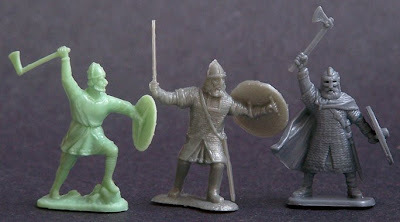 The glow-in-the-dark green Saxon and the sword-wielding Viking in the middle are both produced by Emhar. These are sets, 7206 Saxon Warriors and 7205 Viking Warriors. (The green plastic really doesn't glow, but it looks like it, doesn't it?) The ax-wielding Viking on the right is a Zvezda model. It's from set 8046 Vikings. Zvezda models are usually on the large end of the 1/72 spectrum, but this set is actually a little smaller than the Emhar models. Still, they match quite well. Check out The Viking Way series on BBC Radio 4. You can listen online to this program about the Vikings in Britain. They mention quite a few of the real-life characters featured in Cornwell's novels! They will look great when painted up! 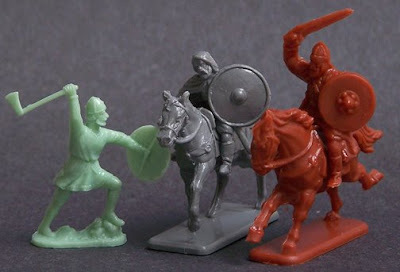 I have the Germanic Warrior set and am painting them up as my Arthurian Antagonists (aka Early Saxons). You are right about the horse, though I think they should be a bit chunky though. However, the MiniArt figures are a bit thicker and taller than other 1/72 scale figures. I also purchased the mini-box set of Franks from HaT. They are small compared to the Germanic warriors but look ok compared to the Late Roman Medium infantry from HaT. They are supposed to be "extras" in my game so small is not necessarily bad.